Many of my patients think I was born lucky, and that’s why I’m thin. But the truth is, I come from a family of obese and diabetic individuals. I grew up in what I consider a very normal Italian-American family. Loving, close-knit and completely obsessed with food. We ate pasta and bread with every meal, and we ate all the time. By the time I was 15 years old, I was a whopping 240 pounds, plagued with asthma and allergies, and the brunt of many cruel jokes. I changed that by changing the way I eat forever. But, I can gain weight more quickly than most and have to be aware of what I eat all the time. That’s why the A-List Diet works for me. It’s a lifestyle—a delicious way of eating foods that are good for you and help you burn fat. It is not a “diet” that you go on and go off. When I was a young man trying to lose weight, I felt there were no resources designed just for me. Most diet programs are either geared toward women—or toward the type of man who can spend all of his free time in the gym. So when I created the A-List I didn’t want to leave anyone out. My A-List Dieter Types include several types just for men, as well as a “Diet Challenged” type for those of us who have been on and off diets for years. For full details on how to unlock the power of amino acids to suit your A-List Dieter Type, order your paperback copy of The A-List Diet now. Believe me, I know the whole idea of weight loss can feel overwhelming. And that’s why I want to help you. Whether you need to lose 15, 50, 100 pounds, or more…I know you can do this—because I did. I take a lot of pride in helping my clients make positive changes in their life. Whether you write to me through email or social media, I am so pleased to hear about your experiences with living a happier and healthier lifestyle. “After I drink the Amino Booster in 16 oz. of water (post workout), I’m not hungry for hours! I used to be famished. 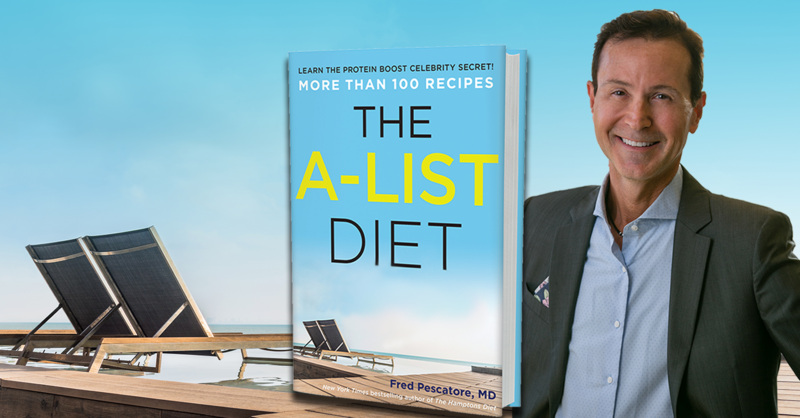 If you’d like to share your story with me, please send an email to drfred@alistdietbook.com. In a medium bowl, toss together the lettuce, purslane, bell peppers, cucumber, celery, chicken, and olives. Add the dressing and toss again. Top with the feta cheese and serve.